I love butterflies... to me, they are pretty, feminine, elegant and represent new life... we even released them at our wedding!! 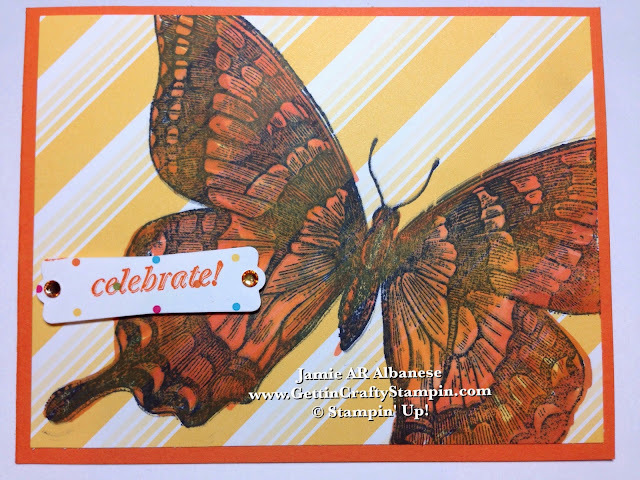 So with a full butterfly garden and a love of these lovely critters... this colorful hand-stamped card comes to life and screams 'Celebrate!'. (Did you know that they sell Butterfly bushes?? I have them and we have many butterflies in our backyard now!!) Find reasons to use this pretty, colorful paper, stunning stamps and accessories... and add color to life! With a bold and pretty paper, this Sweet Taffy Designer Series Paper just POPS!! It screams 'Celebrate!!' Here this Daffodil Delight printed page looks like sun rays to me. 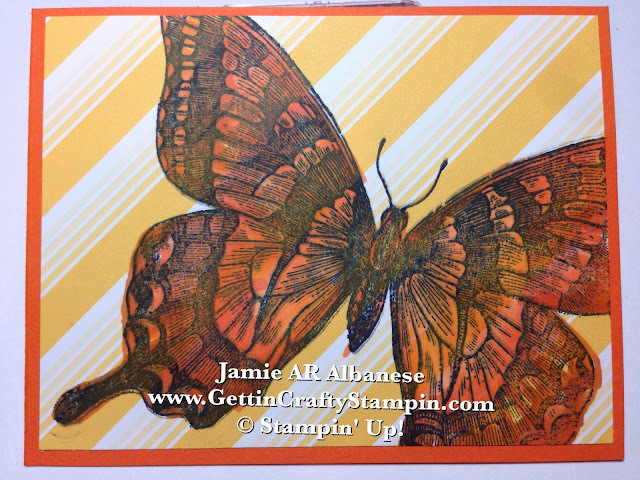 Stamping the Swallowtail background stamp on the page with the Memento ink pad gives me a beautiful image. Coloring it in with the Pumpkin Pie Blendabilites for a ombre color of bright and beautiful colors. Coloring the lightest color towards the body of the butterfly, the medium in the middle and the end for a darkened edge. 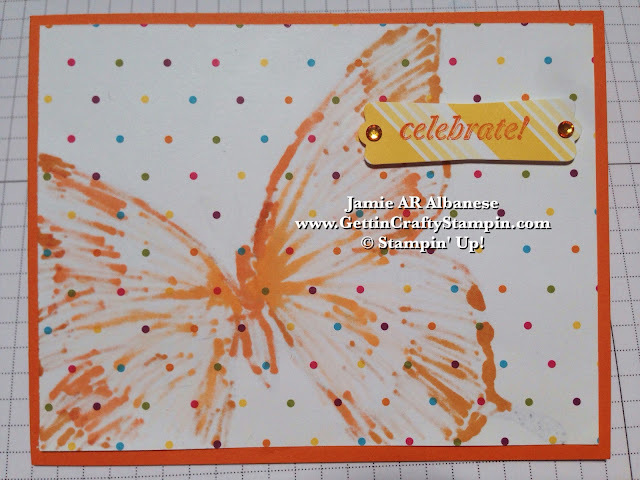 See how cute this mis-stamped but colored in butterfly card came out! 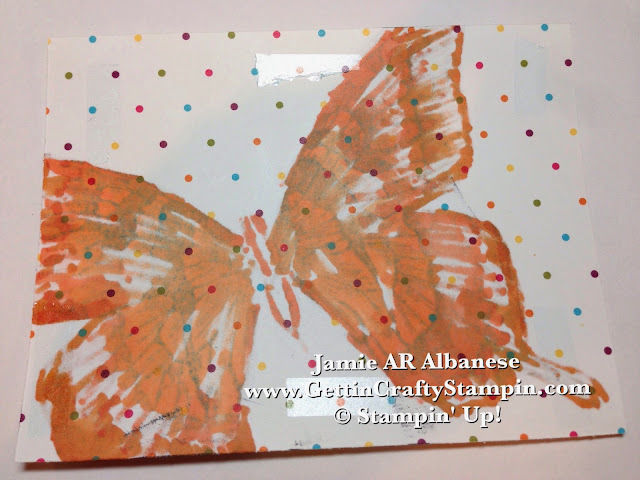 I love the look of an avant-garde butterfly card!! These Blendabilites are an alcohol marker system. They color our Rhinestone Jewels for a stunning 'fire opal' look. Using Scraps of paper - I love to use the 'scraps'. Here with the And Many More stamp set and the Modern Label punch this fun patterned paper coordinates and pops! 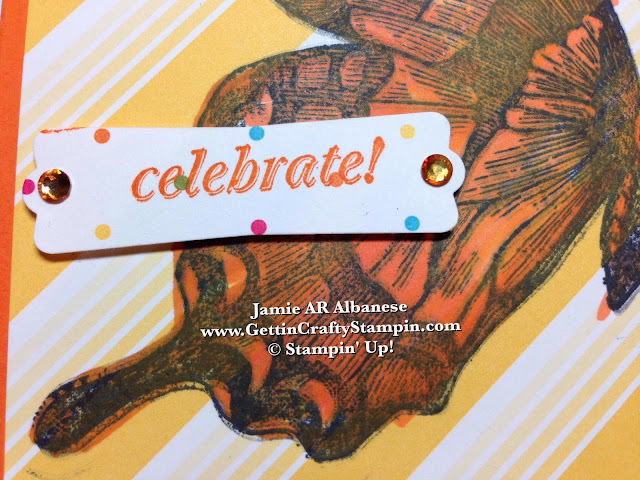 Stamping this new And Many More 'Celebrate!' sentiment with Pumpkin Pie ink ties into the card and covers so many occasions!! The colored jewels are so lovely. 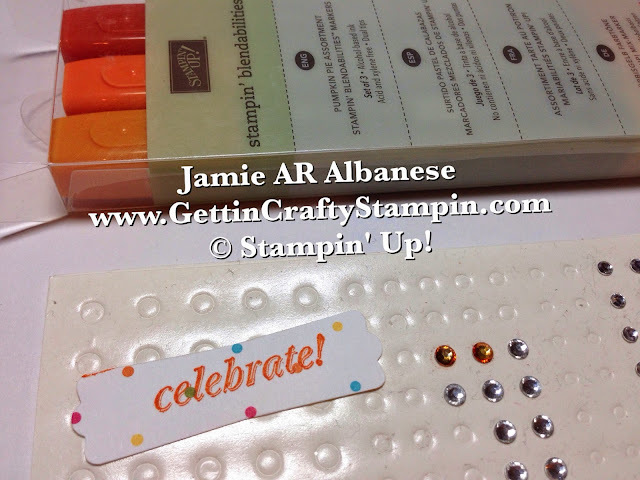 My dear friend, Christine, is a colorful stamper and this card brought her to mind... maybe I'll send it to her! Summer is the season of color - here with colorful paper, stunning stamps, jewels and more you can send sunshine and life! Butterflies are a great way to cover many occasions and deliver smiles. This delicate creature represents strength, new life and joy. I hope this delights and brings you some joy... it sure does me. Create a hand-stamped card that will brighten someone's day, easy and have fun doing it!